Vera Bradley knows about change: From its early basement beginnings as a cottage industry selling unique luggage, to its profitable and publicly traded global retail enterprise, Vera Bradley has enjoyed colossal growth. 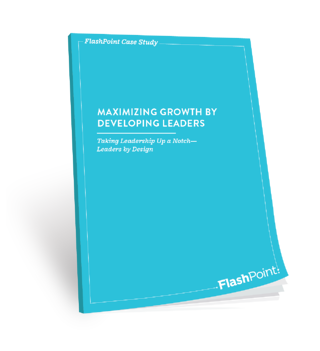 With a vision to continue its success, the company partnered with FlashPoint to develop its leaders. Building on a six-year partnership, FlashPoint had clear insights into the challenges Vera Bradley faced as their growth continued. Tackling these challenges, we customized a leadership development program—Leaders by Design—to be the new umbrella for all leadership programs across the organization. Vera Bradley is a leading producer of designer handbags, luggage, accessories, and housewares. The company is headquartered in Fort Wayne, Indiana, with 2,700 employees. In partnership with the Vera Bradley training team, FlashPoint planned, managed, and co-facilitated Leaders by Design, a multifaceted and experiential 12-month program. High-potential and emerging leaders from across Vera Bradley were invited to participate in the 12-month Leaders by Design program. Each leader had been with Vera Bradley for more than a year and held roles in which he or she had the opportunity to impact others and the company. Curriculum model: Created in collaboration with the Vera Bradley training and development team, this plan outlined all components and measurements of the program. In-person workshops: For continual learning, Leaders by Design included four workshops featuring content from The Leadership Challenge®. 360-degree assessment: To measure program effectiveness, participants took a 360-degree assessment before and after the workshop. The data collected not only helped measure the program's impact but also indicated program priorities. Reinforcement: Ongoing workshops and coaching reengaged and evaluated leaders throughout the year. These exercises helped facilitate real-time feedback and address challenges. Accountability partners: Each participant was paired with a partner to promote accountability, build strong cross-functional relationships, and increase knowledge sharing. Organizational business cases: Participants formed teams to identify a business issue to address throughout the year. Employees collaborated with a sponsor and presented their ideas to senior leaders. 92% of all participants improved their 360-degree assessment ratings in all five practice areas. 68% of the participants are still with the company. 78% of participants have been promoted to positions with more influence. Just as Vera Bradley is committed to growing leaders, FlashPoint is committed to facilitating transformative programs for the company. Leaders by Design continues today, yielding results that have real impact: Vera Bradley is growing effective leaders, and they are building a positive workplace environment—one that translates into satisfied and loyal customers.